On the list of things you truly need (clean air, water, food, shelter), a gym membership falls pretty far down the line. “Oh, sure,” you may reply, “That’s easy for you to say. It’s just sooo easy to work out at home instead.” And to that my reply is going to be: a) You can put that can of sarcasm right back on the shelf where you found it; and b) It actually is easy to work out at home. Or, at least, it can be. This is not your living room gym. Nearly every modern commercial gym is built around the core elements of a cardio area, a weights zone, and a group fitness room. Paying more for your membership adds some amenities such as a pool or three, a yoga room, and live TV on every treadmill, but when you get down to it, there are a million ways to raise your heart rate and lift heavy things—and not all of them require you to shell out $75 or more a month. Thanks to advances in technology, there has never been a better time to replicate, and improve on, the gym experience at home. We’ll show you how to build the perfect high-tech home gym that’s affordable, space conscious, and—most importantly—easy to use. Okay, I lied—not any room. Your first step is to pick a room, closet, back patio, or garage space for your gym. Think about what type of activity you’re likely to be doing and what kind of space you have to work with. If you practice yoga, for example, you may prefer a room with hardwood floors. Regardless, you don’t need a ton of space, but make sure you have enough room for any equipment you might need—and enough room to do Tae Bo without smashing a curio cabinet or ceiling light. Also worth considering: Where are the electrical outlets in the room? Will other furniture or equipment get in the way on a regular basis? Don’t feel you need to cram everything into a single room, either. We keep our treadmill in the bedroom, while nearly everything else goes into a multipurpose room or spare closet. Next? Well, fill that room with a high-def TV connected to either an Apple TV (which can stream from tons of iOS apps), a Chromecast (the cheap option), or a Roku 3 (which has tons of channels and a cool headphone-enabled Wi-Fi remote). An HDTV will keep you motivated, stave off boredom, and help your posture during your workout—since you won’t be staring down, neck cranked, at a small screen. Fitness centers typically feature rows of relatively standard (and fairly pricey) cardio equipment—treadmills, stationary bikes, elliptical trainers, stair climbers, and rowing machines, all lined up and gleaming. That’s overkill for most people, so we suggest starting with a treadmill and/or a bike trainer, which offer the most technology-integration options and have minimal space requirements. You can find plenty of durable, high-end treadmills full of extensive technology, but you’ll pay a premium. With a little creativity, you can keep yourself in the $1000 to $1500 range and still meet your workout needs. The Sole Fitness F80 is a workhorse. • A workhorse treadmill like the Sole Fitness F63 or F80 is best for serious runners. 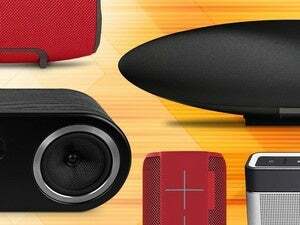 They include great running decks, powerful motors, and incline options, but have minimal integrated technology—and that’s just fine, because you can add all the technology you need with our suggestions below. • A technology treadmill like those from NordicTrack and ProForm add iFit connectivity, and even color touchscreens. iFit is an online service that links your treadmill to the Web for tracking and downloading workouts, and synchronizing with your tablet, phone, or computer. You can even run along a Google Maps path, and your treadmill will adjust the incline to map your route. With treadmills, you get what you pay for. Technology treadmills are best for walkers or low-volume runners since they sacrifice the running deck and horsepower to add gadgets. Alternatively, if you’re flush you could shell out for something like a LifeFitness commercial-grade treadmill and get the best of both worlds. The Wahoo Fitness Key attached to an iPhone. iFit connects directly to your treadmill to get your real speed and incline, while the Wahoo Fitness Key connects to an ANT+ foot pod to get speed and cadence measurements. They replace the GPS tracking we’ve all come to know and love in our outdoor workouts, allowing us to know exactly how far and fast we are going during our indoor workouts. iFit and Wahoo can send data to external devices, so you aren’t constrained to the little readouts on your treadmill, and you can upload the sessions online and combine that data with the info from your outdoor training sessions. Amp things up with a video-training app such as Kinomap Fitness or Virtual Active. They use Digifit technology to track your pace using the camera on your iOS device and then coordinate that data with streaming video of real runs. 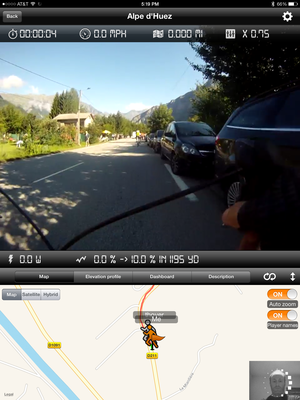 DigiFit estimates your speed by tracking you with your device’s front-facing camera. While it isn’t very accurate in terms of your actual pace, it does a good job of understanding when you speed up and slow down, and it can use this info to alter the pace of the scenery passing you by in videos for a more realistic experience. Meanwhile, Kinomap offers ANT+ sensor support, hundreds of professional and user-created videos all synchronized to real GPS data, and extensive data displays (with a $10 a month subscription). Virtual Active videos are exceptionally high quality, but lack any data display. 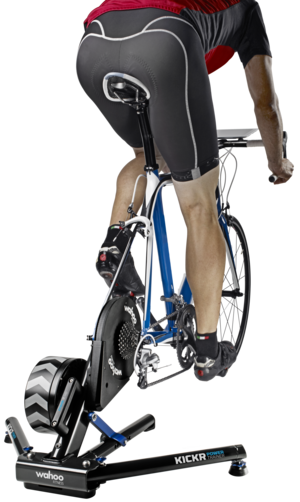 Bike trainers essentially turn your cycle into a stationary bike so that you can pedal it indoors. They take up minimal space and offer a ton of technology options—plus, nearly any bike can work with a trainer (even your beach cruiser), so a secondhand cycle should be good enough. A Wahoo Kickr road trainer. Road cyclists should look at the Wahoo Kickr which links to your phone, tablet, or computer via Bluetooth for precise resistance control. The Kickr does, however, require a road bike due to the gearing. Myself, I use a Kurt Kinetic trainer with the inRide power sensor, which connects over Bluetooth but can’t control the resistance—instead, you control the power by changing gears. InRide uses a magnet and sensor to measure the rotation of your trainer’s resistance wheel and send it to your phone or computer over Bluetooth Low Energy. Since the Kurt Kinetic has a predictable resistance, this speed correlates directly into power to measure the direct force coming out of your legs. Power is a far better tool for measuring workouts than heart rate or wheel speed since it is a true measurement of how hard you are working, regardless of variables like tire pressure, wind resistance, or incline. Either the Kurt Kinetic or the inRide trainer will work with Kinomap Trainer, the cycling-focused bigger sibling of Kinomap Fitness, and will prompt you (or adjust the resistance) to match the power to your road video, which you can stream to your TV. For $10 a month, TrainerRoad on your Mac or PC ditches the GPS video but offers hundreds of detailed workouts, some synchronized with popular training videos (for real pain, check out the Sufferfest series). The Kinomap Trainer takes you for a ride. Training videos can help stave off boredom and, in some case, replicate your real running and racing routes to help you train and prepare. Some even provide real-time feedback or instructional advice so you can improve your form, perform drills, or learn general tips. Some training systems even allow you to compete in real time against friends or strangers on the Internet, just as with multiplayer videogames. If this sounds like a perfect way to kick up your workouts, just open a browser window to Netflix and then launch TrainerRoad and position it on the bottom of the screen. Now you can manage all your workout data while catching up on the latest episodes of Doctor Who. If you have a Mac, you can use AirPlay to mirror your display to an Apple TV—the bigger screen on your HDTV makes it easier to read TrainerRoad’s data while moving, and a TV may be easier to position for better running or riding posture. No, we aren’t going to suggest you go buy Wi-Fi-enabled free weights...mostly because they don’t exist yet. Incorporating weights into your high-tech gym is a boon because they provide a great workout in a limited space. Resistance bands, adjustable dumbbells, a pull-up bar, and some suspension straps offer endless resistance-training options and all fit on a closet shelf. 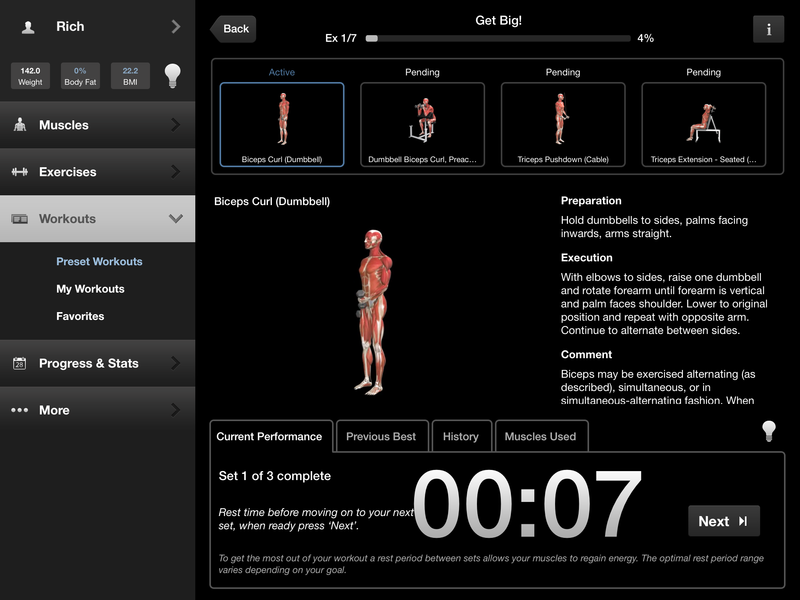 iMuscle 2 provides plenty of details on workouts and physiology. When it comes to tracking your progress or enhancing your weight training, tablet- or phone-based fitness apps are the best way to go (desktop apps are harder to use during a workout). Not only do they provide endless suggestions, but many also have embedded timers and can track your sets and reps. Full Fitness, iMuscle 2, and Fitness Buddy offer a great variety (with different platform options). You can also use any lifting tracking app to record your progress while you play a fitness video on your TV. The reason gyms work for so many people is that it’s a lot easier to push yourself harder when you’re situated next to that ripped dude in spin class. A great way to re-create the group fitness experience at home is to add a fitness component to your game console—for example, Wii users can grab a Wii Fit board, and Xbox fans can load up on Kinect fitness games. 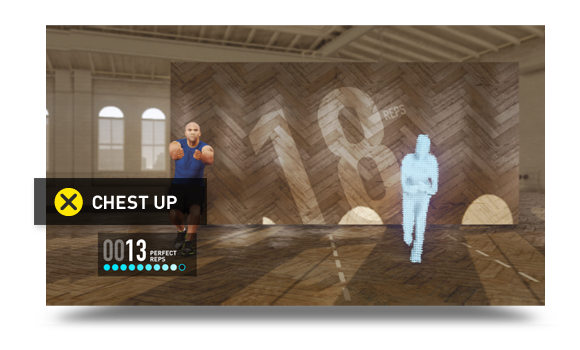 These options lead you through organized workouts, and the Kinect tracks your movement to keep you in proper form. Nike+ Kinect Training in action. For Kinect, Nike+ Kinect Training is the general workout game to beat, closely followed by miCoach by Adidas and Your Shape Fitness Evolved 2012. Or try something more specific like Zumba Fitness Rush, or the more game-like Kinect Sports. If yoga is your sport, unroll that mat and launch a yoga app such as Yoga Studio, All-in Yoga, or Pocket Yoga for endless options, mood music included. If you want to get really fancy, add some Philips Hue color-changing lights to emulate the yoga studio vibe. For a post-workout massage, try a TriggerPoint Performance roller and hit the company’s website for creative ways of inducing pain but speeding recovery. TriggerPoint provides myofascial release, which is a semi-geeky form of self-massage. It’s not exactly high-tech, but the technique is being shown to really help with post-workout and injury recovery. What a Wello training session looks like. If you’re not much of a gamer, then consider Wello, a personal training service that allows you to work out with a group—or one-on-one with a personal trainer—over your laptop for a small fee. Now you can get a group exercise experience anywhere and anytime.